Have you bought coffee on your mobile phone yet? Mobile phone payment systems have been around for almost three years, and Starbucks was one of a few large retailers to pilot the technology. Now PayPal has launched its mobile payment program Paypal Here, signaling that phone payments have gone mainstream. Not only will we be buying more lattes by phone, but more nonprofit goods and services, including workshop fees, concert tickets, and festival tee shirts. Nonprofits have begun using mobile platforms so that supporters and customers can make payments on the go. The Girl Scouts tried out mobile payments for cookie sales this year, and the Salvation Army used the technology for holiday donations. A handful of farmers’ markets are piloting mobile sales, and several savvy museums and concert halls now offer the option. Mobile payment companies like Square and LevelUp have been around a few years, but Paypal Here is expected to take the technology to the masses. The Paypal Here app can be used to accept any credit card or debit card, as well as cash, checks, and, of course, Paypal. Merchants get a plastic dongle that attaches to the phone through the headphone jack and acts as a reader. 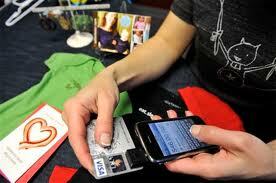 They can also use the iPhone camera to read the credit card, and the system can generate electronic invoices. PayPal Here will charge a flat 2.7% rate for swiped cards and PayPal transactions and 3.5% plus $.15 for key-in and scan-in card transactions. Sending electronic invoices and scanning checks will be free. Both Square and LevelUp have been used by nonprofits for donations, auctions, and other events. LevelUp works like the Starbucks mobile payments system–after you sign up and input a credit card number, you get a unique code that can either be scanned by a smartphone or waved in front of a terminal. Square, which has a card reader like the forthcoming Paypal service, is the most popular option for nonprofits. With these services, geotracking confirms customers’ locations, so they don’t even have to even take out their phones. Intuit GoPayment uses the same technology, and helped Girl Scout Troops in Ohio increase cookie sales by 13 percent. Are you using mobile payments in your nonprofit? Let us know, we’d love to hear how it’s working for you. Yes. we have the Square system I love it . It was easy to set-up. We haven’t been able to use it at nay major event as of yet but a friend uses it for her business and was ranting and raving about how efficient the system is. Thanks, Irene, We’re glad to hear your review. Keep us posted on how it works at your events.